1994. Refugees traverse a ruined bridge over the Inguri River, which separates Abkhazia from Georgia proper. Photo (c): Tutov / RIA Novosti. All rights reserved. In the Soviet period Abkhazia, a balmy region on the Black Sea coast and popular summer destination among the USSR’s elites, enjoyed autonomous status within the Georgian republic. 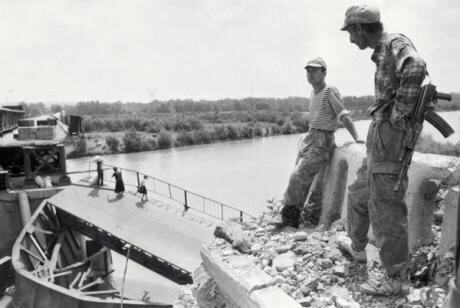 After the collapse of the Soviet Union, ethnic Abkhaz with some Russian support fought a brutal war against the Georgian government in 1992-93. The catastrophe left more than 250,000 Georgians (who had constituted a majority in the region) homeless. In August 2008, Russia recognised the territory as independent – the overwhelming majority of states consider it part of Georgia. The houses in the Georgian village of Orsantia line the road into Abkhazia, a mere 200 metres away past the border crossing point. Of the village’s 3,500 inhabitants, 1,400 are ethnic Georgian refugees from the unrecognised republic, who fled their homes during the conflict. The centre of this small settlement consists of a grocery store, a local administrative building and some half-derelict structures, one of which hosts the office of Egrisi. It’s an NGO supporting both the displaced population and Georgians who have managed to remain in Abkhazia to this day (they still form a majority in the region’s southernmost Gali district, bordering Georgian government-controlled territory). Egrisi’s activities range from providing grants to set up bakeries and building greenhouses for local families. 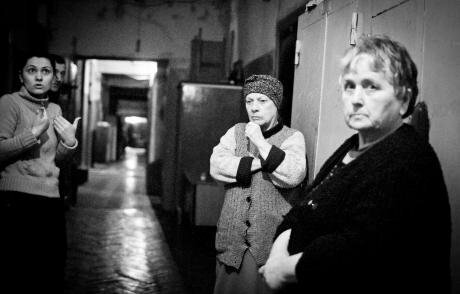 Internally displaced people from Abkhazia in the Georgian capital of Tbilisi, 2012. Photo: CC-by-NC-ND-2.0: Marco Fieber / Flickr. Some rights reserved. The Georgian Civil War of 1991-93 broke out after Eduard Shevardnadze, former Soviet foreign minister, returned to Tbilisi and came to power. Tense relations between the new president and supporters of his predecessor, the first president Zviad Gamsakhurdia, turned into open confrontation. The fighting was accompanied by inter-ethnic conflict in Abkhazia (1992-3) and South Ossetia (1989-92). The civilian population began to leave the conflict zones in huge numbers. As a result of the war, both Abkhazia and South Ossetia, another former autonomous region within the Georgian SSR, declared their independence. Given that the government in Tbilisi still regards both territories as part of Georgia, official documents refer to the refugees as internally displaced persons (IDPs). Most of these IDPs live in areas bordering the two breakaway states: Samegrelo, Imereti and Shida Kartli, or otherwise in Tbilisi. According to Georgia’s Ministry for Refugees and Resettlement, more than 265,000 IDPs (about 6% of the population) are live in a country which has already seen its population drain away due to labour migration to Russia and the EU. The war was long ago, but the arrangements for the collective resettlement of forced IDPs are still in place. Only a few refugees have been able to start new lives: the vast majority are still dependent on government handouts. Many of them still live in difficult circumstances – usually in old sanatoriums and holiday camps. In Kutaisi, for example, one building still houses several refugee families, now including children and grandchildren. The rooms are in total disrepair, with cardboard replacing the earlier glass in the windows. As the years pass, it is also becoming ever more difficult for the Georgians who were forced out of Abkhazia to visit their relatives and their old homes in the unrecognised republic. In March 2016, the Abkhazian authorities closed two border crossing points on the Inguri River, which serves as the border with the breakaway territory. A year later the same thing happened in the villages of Otobaia and Nabakia, leaving only one central crossing point - across the Inguri River bridge. Locals say that it now takes at least three hours to cross the border. What’s more, only people who have kept their old Soviet passports with their Abkhazian residence stamps or have a special pass issued by the Abkhazian authorities can cross freely. Anyone without the the right papers has to get an official invitation from their friends or relatives and pay for a visa. Up to March 2017 the whole business was free and took 15 minutes, according to locals. Russian citizens don’t need a foreign passport to visit Abkhazia, so Georgian border officials can’t monitor their visits to the unrecognised republic, but under Georgian law they are formally forbidden. To avoid breaking the law on occupied territories (Georgia considers Abkhazia to be under Russian occupation), citizens of CIS and EU countries have to enter it from the Georgian side. Some Russians friends of mine, however, have been refused entry through Georgia and recommended to enter the territory from Russia (in 2014 the intrepid traveller and blogger Aleksandr Lapshin, who has joint Russian and Israeli citizenship, managed to visit Abkhazia this way, although not without problems; he has recently been sentenced by court in Azerbaijan to three years in prison for visiting another self-declared state, the Republic of Nagorno-Karabakh). 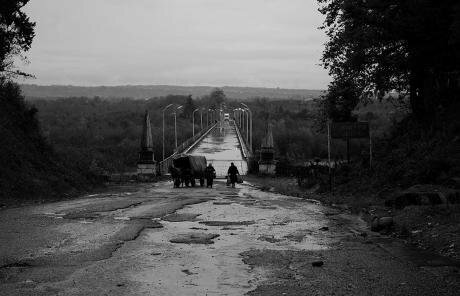 Today the bridge over the Ingur River has been rebuilt, but the road home is still closed to displaced Georgians. Photo CC-by-2.0: Anya / Wikimedia Commons. Some rights reserved. In Nabakia today, on the Abkhazian side of the old bridge, fencing mesh has been put up between the concrete piers and the concrete blocks massively reinforced. There are no official border guards on the Georgian side, since Tbilisi doesn’t recognise the bridge as a legal border (though police SWAT teams in full combat gear patrol the area). Despite the closure of the crossing points, some Abkhazians still slip across the border to buy their food. There are crowds of them Zugdidi market every morning. Back in the day, the Abkhazians used to be traders themselves, selling nuts and mandarins. Since the authorities in Abkhazia’s de-facto capital of Sukhumi have introduced export duties, so there’s no money in that anymore. Many families still live in two houses: according to Biblaia, the elderly generally prefer to stay on the Abkhazian side of the bridge, while the youth prefer the Georgian side. Some refugees who are officially registered as living in one of the border villages actually live in Tbilisi, but receive various social benefits thanks to their refugee status. “The state hands out grants for university education, and provides free medical assistance and benefits,” says Bibilaia. It’s an open secret that people living in the unrecognised republic also go to Georgia for their healthcare needs; provision in Abkhazia is not adequate, but to be seen by a Georgian doctor, you’ll need a Georgian passport. Many people try to keep this quiet, she continues, as they might get into trouble at home. At the moment, Ukraine is trying to set up a similar scheme for citizens who continue to live in Crimea, Donetsk and Luhansk. Irakli Khubua, who also works for Egrisi, tells me that most refugees still don’t feel at home: “There are mixed marriages, but people still feel like outsiders.” One factor here is the refugees’ densely crowded accommodation and the fact that their status gives them access to extra social welfare payments. In Gori, for example, there are whole neighbourhoods entirely populated by refugees. The derelict Hotel Khvamli in Kutaisi. Once intended to be temporary accommodation for those displaced, it is still inhabited by IDPs - and their children. Photo (c): Mari Nikuradze / openDemocracy. All rights reserved. “Some even prefer not to marry”, says Khubua, “so as not to lose their refugee status and the benefits that come with it.” NGOs are also involved in preserving memories, recording the exact locations the Georgians fled from. In Georgia, the most important element in this process is the Abkhazeti Centre. In conjunction with the Danish Refugee Council and with EU financial support, Abkhazeti has coordinated the construction of homes for refugees since 2016, as part of a state programme for sustainable resettlement. However, says Nino Mindiashvili, who heads the “Ray of Hope” NGO, this kind of aid is often a disincentive to work (provided that employment can be found anyway). “The men have got used to getting handouts; now it’s just the women who work while the men prefer to wait for their benefits cheques,” sighs Nino. One tradition which knows no borders holds that burial rites should take place in a family cemetery. Tsitsino Biblaia, for example, walked 11 km into Abkhazia in secret, in order to bury a family member. “We didn’t all have the necessary documents, so my brother and I carried the zinc coffin, containing all 165 kg of him, along winding forest paths. Once on the other side, Abkhaz villagers – total strangers – came out to help us.” The wish to be buried on one’s forefathers’ land at all costs remains as normal to IDPs as it is bizarre to outsiders. Nevertheless, for many children of IDPs, Abkhazia has become a foreign country. Young people who have grown up in Kutaisi or Tbilisi are mainly interested in finding work and somewhere to live. For them Tskhinvali, Ochamchire, or Gali are just names lodged in their memories, toponyms from the land of their ancestors. Every day, Zhuna comes to look after her great-grandsons at the two-storey hostel that the authorities have provided for the IDPs. Apart from an Ikea cupboard in the hallway, the atmosphere and decoration reeks of the Soviet era, with carpets hanging on the walls and china figurines on the shelves. The flat is heated by a cast-iron stove; there is one shower per floor, water from a well and some of the neighbouring flats are abandoned, their windows smashed. These refugees have been living here for a quarter century, but don’t want to renovate or redecorate anything themselves. 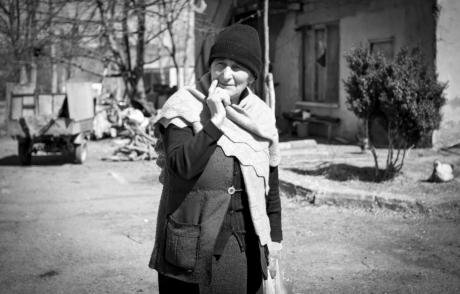 An elderly refugee from Abkhazia in the village of Shkra, central Georgia. Photo CC-by-NC-ND-2.0: Marco Fieber / Flickr. Some rights reserved. Ordinary Georgians I spoke to blamed everyone except their own government for what happened back in the early 1990s. For their part, international observers also report that crimes were committed against peaceful civilians by both sides of the conflict. Many people still launch into geopolitical debates: some blame Gorbachev, others Putin. Leah Tchlachidze, who runs the Ergneti Rehabilitation and Development Centre and moved from South Ossetia to Georgia after the five day long Russo-Georgian War in 2008, believes that one of the main reasons for the prolonged conflict has been the Georgian government’s policy towards ethnic minorities. Tsitsino Biblaia, on the other hand, blames Russia for initiating the conflict and maintaining a heightened state of tension: “We’d never had any experience of war, and suddenly here we were, with Georgians fighting against Georgians; Abkhazians against Abkhazians, and everyone against everyone else. It was an internecine war. But the Abkhazians had never had any problems or complaints before. They probably still want independence, but it would be easier for us to come to an agreement with them if the Russian troops left. How can we go back home now? I haven’t even considered it. I’d come back to my old house, and a stranger would be living in it. I couldn’t throw him out – it would take a war to do that”. I have visited Georgia a number of times, and have probably spent a total of over two months there. I’ve mostly hitchhiked from place to place, and Russo-Georgian relations – especially the conflict with Ossetia and Abkhazia in 2008 – have inevitably come up in my conversations with drivers. Despite the deaths of innocent people at the hands of Russian forces, the break in official diplomatic relations between Russia and Georgia and the appearance of the self-proclaimed South Ossetian and Abkhazian republics, I have always found Georgians friendly and well-disposed towards me as a Russian. In most cases they have welcomed an opportunity to speak Russian again, criticising both governments for their military escapades. 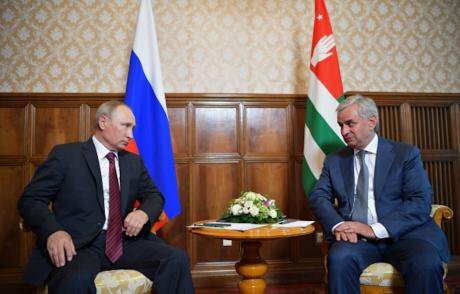 Vladimir Putin meets de-facto president of Abkhazia Raul Khadjimba. Putin’s visit to the self-declared republic on 8 August this year was timed to coincide with the anniversary of the 2008 Russo-Georgian war, after which Russia recognised both Abkhazia and South Ossetia as independent states. Photo (c): Alexey Druzhinin / RIA Novosti. All rights reserved. Perhaps, if the Russian government was a bit more far-sighted, it could turn this mood to its advantage. But today’s Georgians are increasingly looking to the west, what with visa-free travel to the EU and a NATO training centre just outside Tbilisi. The position of the IDPs remains, however, unresolved, and they are unlikely to return home in the near future. In the present unstable situation they have few options: they can either sit across the border, yearning to return to their lost homes or move to the capital to earn money and start a new life. While there, they can try to retain their identity as Georgians from Abkhazia. After all, in Georgia, everybody wants to know where your roots lie.